The decision comes after an Ethiopian Airlines Max 8 crashed on Sunday, killing all 157 people on board. Singapore is a major travel hub, with flights connecting Asia to Europe and the US. Several airlines and regulators around the world have already grounded the Max 8 model, following the crash. Singapore is believed to be the first country to ban all variants of the Max family of aircraft. The suspension goes into effect from 14:00 local time (06:00 GMT). 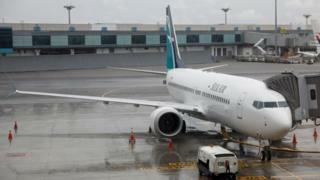 SilkAir, which operates six Boeing 737 Max aircraft will be affected, as will China Southern Airlines, Garuda Indonesia, Shandong Airlines and Thai Lion Air, CAAS said in its statement. The aviation authority said it was working with Singapore’s Changi Airport Group and the affected airlines to minimise any impact to travelling passengers. In the US, the country’s Federal Aviation Administration told airlines on Monday it believes Boeing’s 737 Max 8 model to be airworthy, despite the two fatal crashes.